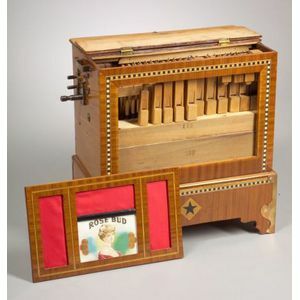 Portable 23-Key Barrel Organ, No. 113, with seven-air barrel, two ranks of pipes, label of J.S. Gebhardt Organ Co., Tacony, Philadelphia, and walnut case with brass reinforced feet and later sound aperture with chromolithograph "Rosebud", wd. 15 3/4 in., barrel 12 in., (playing well). Note: The tunes are Merry Widow Waltz, Chinatown, On Wisconsin, La Paloma, Valencia, Happy Days are Here Again, and Peanut Vendor Song. World Type Writer by the Typewriter Improvement Co.